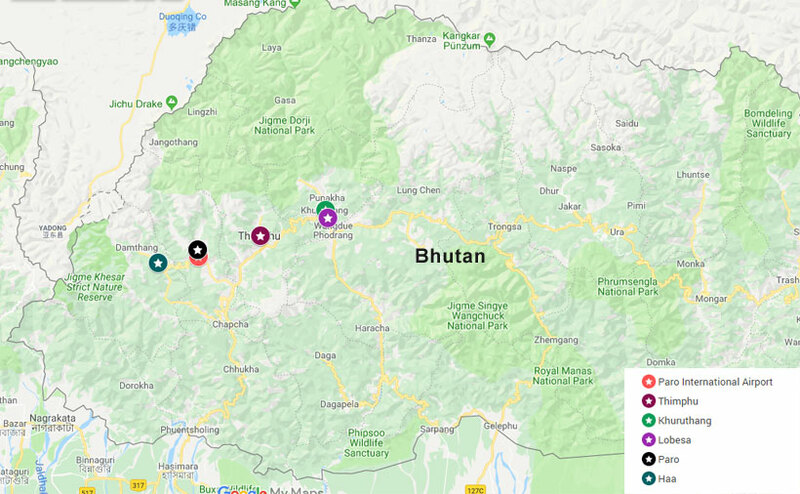 This itinerary takes you through western Bhutan for eight days, but if you have a few days more then include some of the wonders on the east of the country as well. Travelers from India, Bangladesh and Maldives have to get permits that are granted per municipality, to visit different parts of the country. Entering Bhutan from any port of entry (land or air) will grant permits to Phuentsholing, Paro and Thimphu by default. For travel to outside of Phuentsholing, Paro or Thimphu, you must go to the immigration office in Thimphu and apply for permits to the municipalities you wish to visit – Punakha (Khuruthang & Lobesa are cities in the Punakha municipality), Haa, Gangtey, Bumthang, etc. Documents that are required for those permits vary and depend on where you are visiting. For example, Punakha, Gangtey and Haa require confirmed hotel bookings (not asked mandatory! ), whereas for Bumthang you need the taxi driver’s name and taxi number mentioned in the application form. Click here for details on my experience getting permits. Bhutan’s currency is Ngultrum. The Ngultrum is abbreviated as BTN and is pegged to the Indian Rupee. This means that BTN and INR are equally used and accepted in Bhutan. If you’re coming from India or an Indian citizen, then you do not need to exchange currency as your Indian Rupee (INR) is valid in Bhutan. Exchanging currency from anything other than INR at the airport comes with a terrible exchange rate! The best place to exchange currencies (except INR) is in the market in Thimphu or Paro. Check with your taxi driver or tour guide for the best rates & exchange places. Cash or cards – Bhutan works mostly on cash-based system. A very few restaurants or hotels will accept credit cards. And the ones that do accept, will charge an extra 2-8% for any purchases. Transportation – Cities like Paro & Thimphu has ample ‘public’ buses, but shared-taxis are your best and fastest option to travel. Shared taxis cover all of Bhutan, especially the tourist routes. All the hotels accept cash in BTN or INR, while some accept USD as well. EUR, GBP or other currencies are less accepted. A lot of hotels now accept credit cards. Breakfast is offered as a part of the hotel costs almost all the time. Linens/towels/soap are always included in the price. Tap water is not safe to drink. One liter bottle of water from a local market will cost BTN 50 (approx $0.80). Wi-fi – Available in all hotels, although may not work or may be slow. Restaurants do not have wi-fi. Mobile services – For BTN 730 [230 for SIM and 500 for 5GB data] (approx $10.10), you can purchase a SIM card from any BNT (Bhutan National Telecom) store (at the airport right next to the exit door after baggage claim). The validity is 30 days and you can top-up at most groceries stores around the country. I booked hotels before traveling to Bhutan. These were booked after reviewing them on Google, TripAdvisor, booking.com and WikiTravel. Thimphu Hotel New Grand $45.60 Two nights. Double bed with ensuite bathroom. Khuruthang Punakha Residency INR 4,320 Approx $60.84 for two nights. Double bed. Ensuite bathroom. Paro Hotel Phunsum $72.10 Four nights. Two single beds. Ensuite bathroom. Since I was in Asia travel for a while, I booked flights from Kathmandu to Paro and return flight from Paro to Mumbai via Kolkata. All prices are per person. Kathmandu (KTM) to Paro (PBH) Bhutan Airlines $131 One-way flight. Economy. Flight B3 774. Paro (PBH) to Kolkata (CCU) to Mumbai (BOM) Druk Air and Indigo India $121.67 + $70.46 = $192.13 One-way flight. Economy. Flight KB 210 and 6E 326. Note: All values in USD, unless otherwise mentioned, are approximate and based on the exchange rate at the time of publishing. Each cost is for one adult. The exchange rate at the time of publishing is assumed to be USD 1 = BTN 71. Accommodation for all days $178.54 Per person. See the list and costs above. List of all the expenses in this trip.